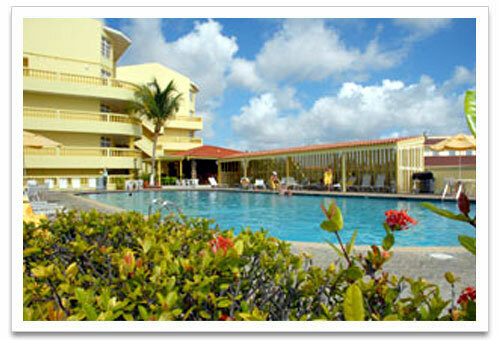 La Quinta Beach Resort is a quaint and comfortable resort located across from beautiful Eagle beach. There are 54 one, two and three Bedroom Suites. It offers 2 large outdoor freshwater swimming pools. There is a pool bar and cocktail lounge. The guests have use of the cabanas, chaises and Tiki tents on Eagle beach. They have babysitting services and a Econo Car Rental desk. There are tennis courts, laundry facilities, mail services and wireless internet available to the guests. There is a mini market on the premises. The Resort also features an intimate Food and Beverage poolside facility offering daily service for breakfast and an extended menu for lunch and dinner. Every Wednesday night, there is an all-you-can-eat BBQ Buffet with a colorful island folkloric dance troupe. The Pool Bar also offers attractive beverages and cocktails with a daily Happy Hour. *The Screaming Eagle Restaurant is on the premises. La Quinta Beach Resort accommodations consist of studios, one, two and three-bedroom suites with private patios and balconies. They are all air-conditioned, spacious, well appointed and include king-sized beds, fully equipped kitchens, spacious living rooms, private bathrooms, safety deposit boxes, cable TV, DVD's and there are Jacuzzis in some suites. The studios easily accommodate two (2) persons. The one-bedrooms comfortably house up to four (4) persons. The two-bedroom suites accommodate a maximum of six (6) persons and the spacious three-bedrooms easily provide accommodations for up to eight (8) persons.